"It is time that we recognized your history and that we protect your indigenous lands from corporate interests and people that are out there to exploit them," added DiCaprio. "It is time that we heard your voice and protected them for future generations." 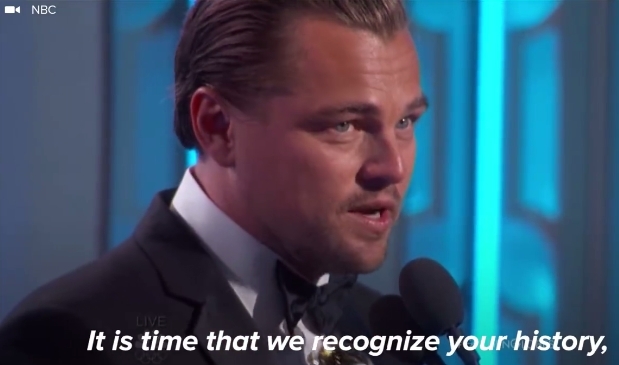 Leonardo DiCaprio: "It is time that we recognized your history." 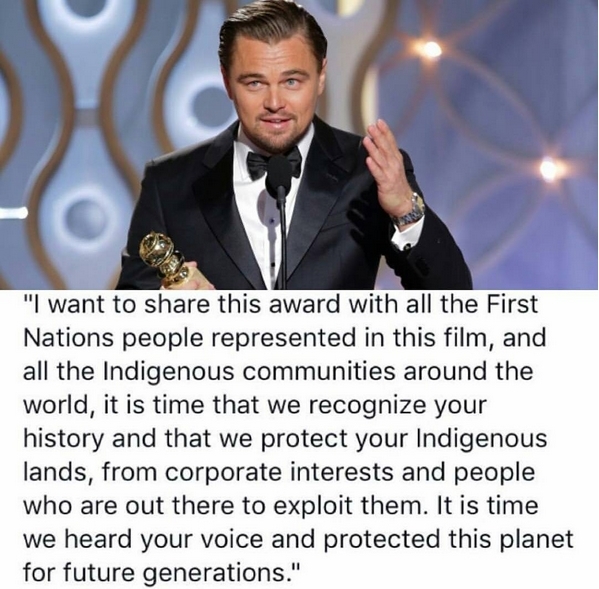 Responses to "Leonardo DiCaprio: I Want To Share This Award With All The First Nations People"
Before Columbus and industries, we could drink water from the rivers and streams as the Indians took great care, moved to new locations so they would not over farm and over take the animal food sources, now we kill animals as they get in the way of humans when the reality is true, we are getting in the way of the animals. If we keep this up, like Easter Island, there will be no animals or food along with no tree's which means no crops. Industry is out for money, to grow, to prosper with little to no respect as to where these minerals come from. The indigenous peoples are and represent the pure essence of mankind. They live in harmony with nature and respect it. The industrialized nations are killing the natural world and many species of the beautiful wildlife. I fear that we are taking away something that can not be replaced.